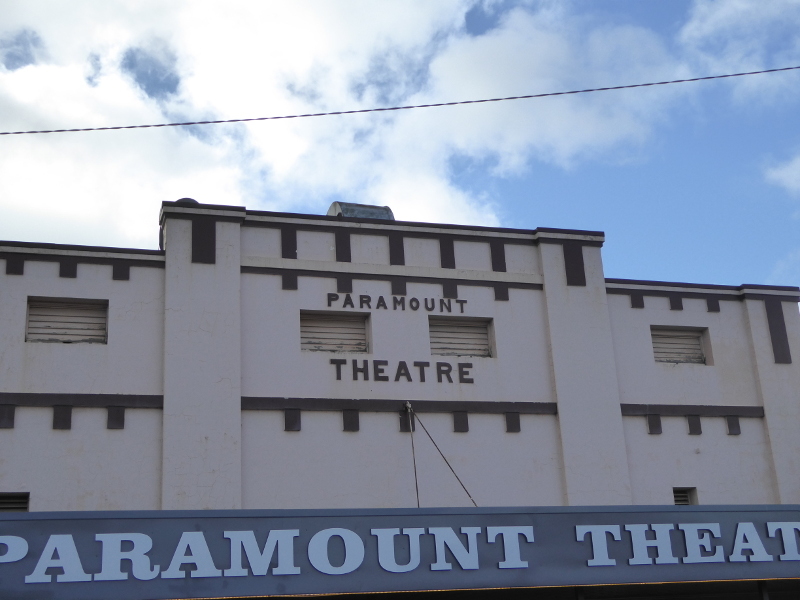 If you like vintage cinemas, feast your eyes on the façade of Maryborough’s Paramount Theatre, which opened in 1926, but then lay dormant for quite a few years before the current owners got it back into screening movies in 2017. When I wandered through Maryborough a few years ago, there was an old chap occupying the building (I’ve no idea whether he owned it or anything about the rights or wrongs of what he did). He showed me round his ‘museum’, which was basically a jumble of old stuff higgledy-piggledy strewn around the auditorium, with 1930s projectors still sitting in upstairs in the projection room. To be honest, it wasn’t great, though it was good that he made an effort to keep the cinema going rather than being converted to flats or a hotel or something. The new owners, about whom more in the links section below, decided to gut the place and bring it into the 21st century. So, I recognised the main staircase into the big auditorium, but for the rest, the fittings and the layout are all 2017-8. So, if you are a vintage cinema lover, there’s not a lot to see inside (unless of course I missed some hidden secrets, and I’d love to know if there are any…). 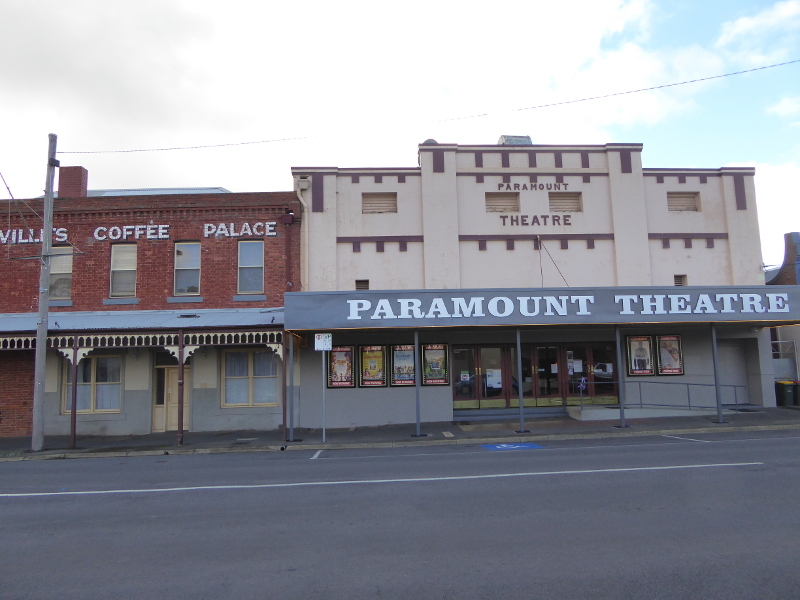 I think it’s great that there is once again a cinema in Maryborough. A town this big needs a cinema, and it’s nice that it can be on the site of the original picture theatre in town. I guess I’d like to have seen a tiny bit more heritage or history somewhere to remind locals of what crowds used to come here in its heyday. The film we saw here was appalling, by the way. Seats are comfortable, though, so it was not a bad way to spend a chilly Sunday morning in late July. I also like the fact there was once a Coffee Palace right next door to the cinema (see the white lettering way up high to the left of the theatre). Ah, how nice it’d be to have a vintage coffee shop here next door to a vintage cinema. But maybe that is all too Fitzroy and Carlton rather than what folk in Maryborough are after. Thing is, in Ballarat, they kind of manage that…But Post-scriptum: on my latest trip through Maryborough, I noticed new posters in the windows of that old coffee palace, suggesting the venue might be opening up as some sort of vintage tea room. So, maybe somebody else had a similar idea to ours: if so, good luck to them; we’ll be back all the more often. The Paramount Theatre has a Facebook page, on which it publishes its weekly schedule of films. $16 a ticket on our day. There was seating for 1,200 people when the Paramount first opened its doors in October 1926 to an opening bill of films called Graustark and The Silent Accuser. Graustark was a romantic western and The Silent Accuser starred a police dog who was the only witness to a murder. A series of Buster Keaton movies was shown on the second night. An advert taken out by the Paramount Theatre in Melbourne’s Weekly Times of 28 May 1932 spoke of the theatre as ‘Maryborough’s house of refined entertainment’. “The most up-to-date Picture Theatre in the Midlands of Victoria. Every picture a hit!” apparently…and the “Courteous Uniformed Attendants” were obviously seen as a draw…Well in those days, you dressed up to go out to the flicks, so it was only right that the ushers should join in the elegance, I guess. Charles Kingsford-Smith, the aviator who gave his name to Sydney Airport, used to tour the country showing movie clips of his flying action. He appeared at the Paramount in 1932 as part of his tour to show off his flight across the Pacific Ocean. The most popular movie in the history of the Paramount was apparently a 1955 pic called A Man Called Peter. My old Time Out compendium of film doesn’t give it much of a rating, but the people of Maryborough flocked to see it and sold out the theatre three nights in a row in 1956. In an interview with the Maryborough Advertiser newspaper in 1983 staff member George Guiney is quoted as saying: “Maryborough was a good picture town, but you couldn’t put high class stuff on. It was an adventure and action town,” he said. Strange that an earnest film like A Man Called Peter should pull in the crowds therefore. 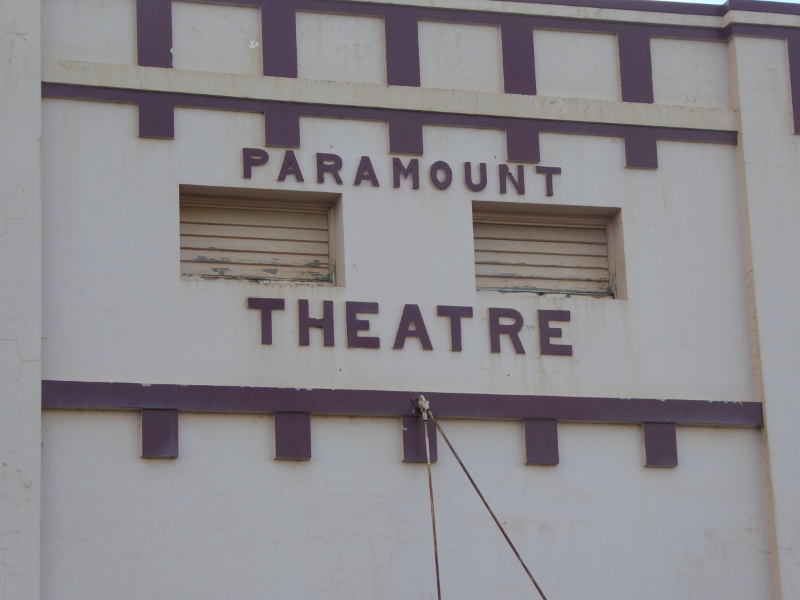 As with so many other cinemas, the Paramount began to lose its shine with the advent of TV. It was packed on New Year’s Eve 1960, though, when hundreds of children were locked inside for their own safety when a massive storm hit the town during the afternoon matinee. 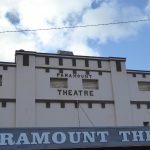 The Paramount was bought by the Education Department in 1964, and used for some years as a gym and hall for schools, though teachers did also show occasional films in what had by then become known as the Assembly Picture Theatre. The lights flickered on and off over the following decades as various people tried to get the cinema running again, but they were generally short-lived. It was a working cinema showing films from at least 1996-2004, but by 2006, it had been bought by Rod Bow, who must have been there when I poked my head round the door a few years ago. He kept it as a kind of museum, though he did open it up for film audiences to mark the cinema’s 80th anniversary in 2006 and the 85th anniversary five years later. And then in 2016 the current owners took on the Paramount and really brought it into the 21st century. 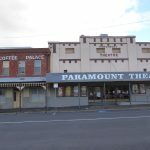 Helen and Gerard White (see links below) are quoted as saying “We wanted to bring a cinema back into town because we think Maryborough needs a good cinema,” and they were keen to preserve the old frontage, even if the interior was mostly taken out. Hats off to them and long may it continue in action now. Cyril Leist worked at the Paramount from shortly after it first opened, until the day it closed its doors in 1962. 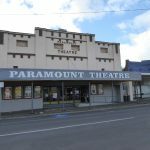 Thanks to the Maryborough Advertiser for interviewing Cyril (and George Guiney) in 1983 when these two gents still lived in town and had lots of memories of the Paramount. Cyril began as a rope attendant in the front stalls. Part of that job, especially in the silent movie days, was to help sort out music requests from the audience for numbers to be played before the films were screened. Once soundtracks were added, his job became more technical and he remembered being recalled from the middle of his honeymoon in 1930 to help sort out the sound for a film called The Gold Diggers of Broadway. The most tragic of his cinema stories, though, was that he had collected 36 years’ worth of film posters for every film on while he worked at the Paramount. But the whole collection was lost in a flood that rushed through his home one year. What an utter tragedy! 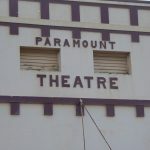 This Art Deco Building blog focused on the Paramount in 2009, when it was under different ownership. 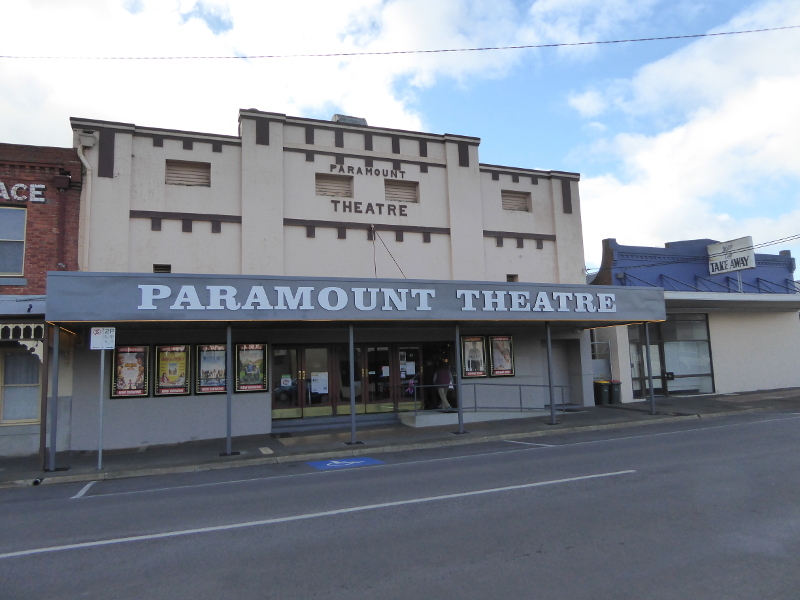 This 2016 piece in the Maryborough Advertiser profiles the new owners who had just bought the Paramount. What are your memories of the Paramount? Coffee before the pic or a bite to eat after? Best coffee in Maryborough? Storm in a Coffee Cup is right opposite Maryborough’s vintage post office, so about a five minute walk from the Paramount. This coffee shop (only open Mon-Fri, plus on market days) sells the best coffee in Maryborough and has a fine selection of loose leaf teas, too, all blended by a local lad called Tony. The coffee also comes from not too far away, in Castlemaine.